A 20-year-old man was arrested yesterday. 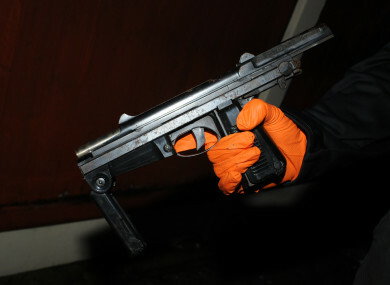 The gun which was seized. MEMBERS OF THE garda Drugs and Organised Crime Bureau have seized a loaded submachine gun in west Dublin. Gardaí, as part of a planned search, yesterday carried out a search in the Balgaddy area of Lucan, west Dublin. During this search operation, a loaded PM–63 RAK submachine gun with an additional clip of ammunition was recovered. A man, aged in his 20s, has been arrested and is currently detained at Ronanstown Garda Station. It is thought the find is not directly linked to the Kinahan/Hutch feud. However, it is instead linked to a local feud based in the west of the capital. Email “Gardaí seize loaded submachine gun in west Dublin ”. Feedback on “Gardaí seize loaded submachine gun in west Dublin ”.